Is it a cheesecake? It is a tart? Even better, it’s both. 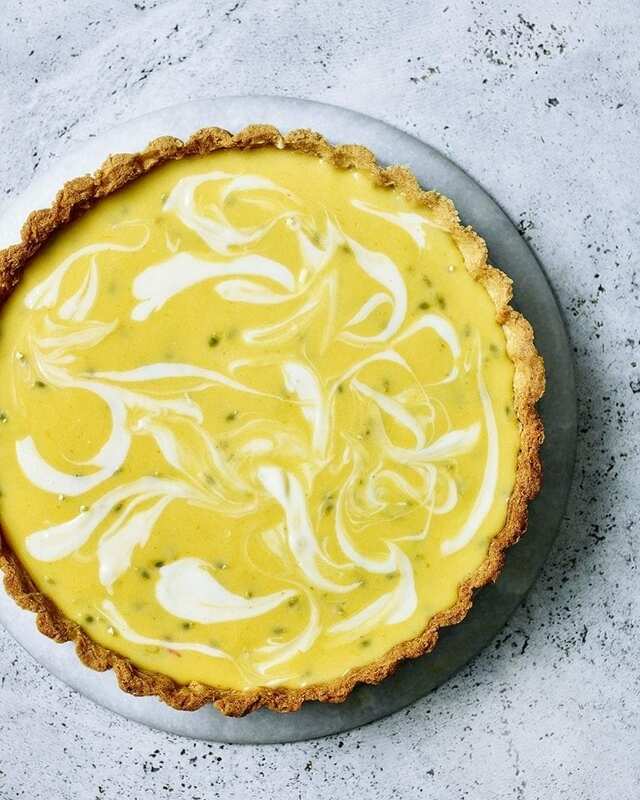 Try this zesty lemon, lime and passion fruit tart for a dinner party dessert that’s guaranteed to impress. Grate the dough into the tart tin, then quickly press evenly into the base and up the sides of the tin with your fingers to make a tart case. If it starts to feel greasy, chill it in the freezer for 5 minutes, then continue. Freeze for 1 hour. Heat the oven to 180°C/160°C fan/gas 4. Line the chilled pastry case with foil and fill with baking beans. Bake for 25 minutes, then remove the foil and beans and bake for 3-4 minutes until the base has no grey patches and feels sandy. Set aside. Soak the gelatine leaf in cold water for 5 minutes. Heat 3 tbsp of the filling in a small pan, remove from the heat, squeeze the water out of the gelatine leaf, then stir it into the hot filling until dissolved. Stir the mixture into the filling in the bowl. In a separate bowl, mix the cream cheese with the icing sugar and the reserved lemon juice. Pour the filling into the pastry case, then dollop small blobs of the cream cheese mixture over the top. Use a skewer to swirl the mixture into pretty patterns. Leave the tart to set in the fridge for at least 3 hours before slicing. Freeze egg whites in a freezer bag, marked with the date and number of whites, for up to 3 months. Make the pastry up to 1 month ahead and freeze, wrapped in cling film and foil. The tart can be made up to 48 hours ahead and kept in the fridge.